Free Printable Letter W Tracing Worksheets. Print the free letter W tracing practice to help kids improve handwriting at classroom or home. If your kids need to practice handwriting at recess, tutoring, breaks or summer, you can use this worksheet to get ready for the next school grade. The tracing worksheet includes numbered arrows, red dots starting guides and faded letters to trace. Every 5 letter row becomes more difficult with the dotted fonts and blank rows to practice without guides. Then kids can practice words that start with the letter W, like Wagon and Whale. Select from Uppercase Letter W, lowercase letter w, Cursive W Uppercase and Cursive w lowercase tracing worksheets. 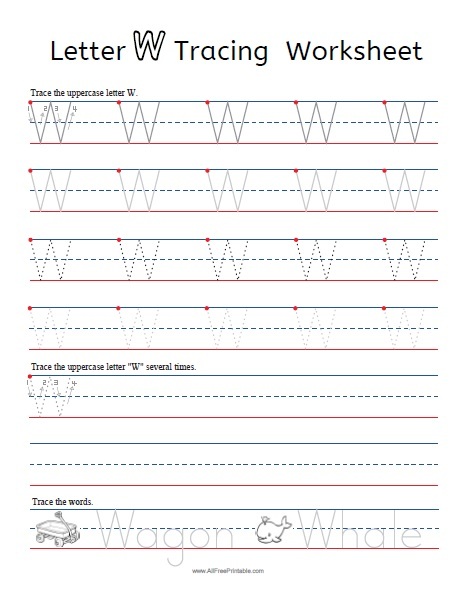 Letter W Tracing Worksheets available in easy to print PDF format. Instructions: Click the print link to open a new window in your browser with the PDF file. Then you can print or download using your browser’s menu.